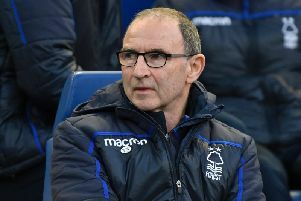 Nottingham Forest eased past Ipswich Town last Saturday and secured fifth place in the championship table by doing so. What impressed me most about the victory was the collective level of confidence throughout the side. The two nil score line really flattered Paul Lambert’s men as the home side could have easily bagged five before the final whistle. Both Forest goals were dispatched by who else but Lewis Grabban, bringing his league tally to fourteen for the season to date. Over the last few matches the likes of Grabban, Lolley, Darikwa and Dawson have been the stand out performers. But, if you scrutinise the output of any given member of the Forest boys, you’ll notice that the bar has been raised significantly. As I watched the Reds comprehensively dismantle the Tractor Boys from my position in the commentary box, I couldn’t help but notice just how confident Karanka’s men were in any given situation. That is testament to the manager, it’s not something that happens by chance. Forest seem to close opposition teams down so quickly these days, and even more impressive is the conviction they exhibit when they regain that possession. Not so long ago, our players would almost avoid receiving the ball, and when they did get hold of it, they’d opt for the easy option of a sideways or backwards pass. Following the 5-5 draw at Aston Villa I noticed a bit of criticism aimed at the defensive performance on the night. However, for both former European Champions, it was a flash in the pan. Villa will be a play off side at very least under the new management of Dean Smith and the same goes for Aitor and his Red army. Despite the defensive and goal keeping anomalies, the confidence levels going forward were exemplary. Matty Cash’s goal was a prime example, a year ago he wouldn’t have showed the courage of his convictions as he did in scoring our third goal of the game. When all’s said and done, it’s one of those matches that you put in the locker and do not dwell upon. I speak from experience when I say that, bizarrely, I once played in a 5-5 draw against Forest for the Peterborough United youth team. When we reached the changing rooms there was absolute silence and a look of sheer disbelief on every players face.Take the point and move on! Next up for Forest are Preston North End, who suffered their first defeat in ten games at Birmingham last weekend. Given the fact that their very own confidence levels have been abruptly thwarted, and that ours are increasingly elevating, you’d like to think that it’s a winnable contest. Reverting to the Ipswich game, a man whose confidence levels were almost through the roof was again Tendayi Darikwa. Darikwa is unrecognisable from the player we saw earlier in the season, and his all round game is at its zenith right now. His marauding run and composed assist for Grabban’s opener was simply perfect, had Dias not spurned the easy chance to double the lead, again beautifully provided by Darikwa, it would have been a fitting culmination for the Zimbabwe international’s efforts. Boy is he proving me WRONG! Of course, there are areas of concern within our side, as there are within any of the top seven or eight clubs right now. However, I see something different at the club of late, a belief and willingness to push on and be better than whoever is placed in front of us. It’s a competitive edge and level of confidence that has been missing for quite some time. Essentially, it’s exactly the mentality required to succeed in whatever your goal may be, you know, that fine line between confidence and arrogance, beautifully personified by the likes of Brian Clough and Tyson Fury, who talk the talk, and almost run the walk! There will be more defeats for Nottingham Forest this season of which I’m certain, who knows, maybe against Preston? But, if we maintain these levels of confidence we’ll be in the mix for sure!